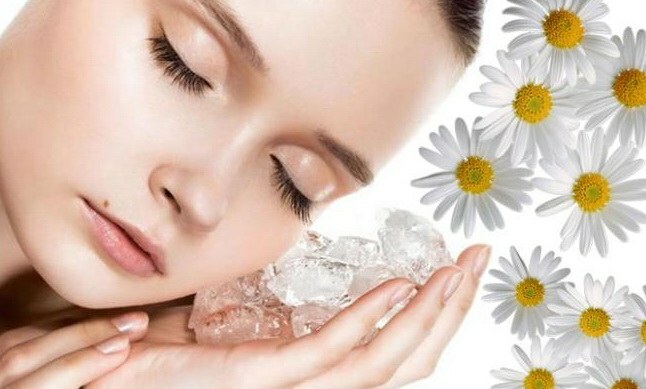 Ice with chamomile is a very popular cosmetic. You can apply it for any type of skin. Ice cubes perfectly clean and refresh the skin. In this regard, they are a good alternative to tonic for the face. Forms for ice, chamomile broth, water, freezer. A traditional recipe for ice from chamomile. Take a handful of berries of mountain ash and rastolkite. Place the mass in boiling water and insist for one hour. At this time, prepare a decoction of chamomile: pour boiling water 2 tablespoons of flowers and cook for five minutes. Combine chamomile and rowan. In this mixture add about 15 grams of honey. Now the liquid can be poured into molds and placed in the refrigerator until it is completely solidified. Such ice has not only antiseptic and soothing properties, but also is a vitaminized remedy. Ice from chamomile with essential oils. Place chamomile flowers in a glass and pour 300 ml of hot water. Insist water for one hour, and then strain and cool it. Now add essential oils: geranium, mint and pink. It will be enough for five drops of each. To ensure that the oil is evenly distributed, close the container and shake it well. After this, pour the infusion into molds and immediately put in the freezer. The ice thus prepared has really gentle properties: it reduces inflammation, soothes and cleanses the skin. Cosmetic ice based on herbs. This recipe is suitable for those who suffer from dilated pores on the face. Take one third of the lime color, one third of the chamomile, one third of the elderberry flowers and a half teaspoon of honey to a glass of boiling water. Cook the mixture of herbs for three minutes, and then strain. Add honey only when the broth cools. The resulting infusion is poured into the cells and placed on the freezer. Ice to remove swelling around the eyes. Necessary ingredients: 1 / 4 black tea, 1 / 4 green tea, 1 / 4 chamomile and 1 / 4 St. John's wort. Pour the mixture of herbs with a glass of boiling water and insist for one hour. After this, strain the liquid, pour it over the cells and send it to the frost. Frozen tea combined with chamomile and St. John's wort perfectly tones, returning the skin of the face a natural and healthy color. Performing an ice massage, lead the cubes strictly along the massage lines. Do not forget about the area around the eyes. From the middle of the chin, lead the cube to the lobes of the ears. From the corner of the mouth to the ear canal. From the side of the nose to the upper part of the ear. In the upper eyelid, draw a cube from the inner corner of the eye to the outer corner. From the middle of the forehead lead the cube to the temples. Try not to over-cool the skin: a one-time contact lasts for five seconds. The whole procedure of rubbing takes from three to five minutes. Drive the cube on the skin until it completely melts. Then allow the skin to dry itself: the infusion should be absorbed.